This is the last article on rkatsiteli this year. Early next year, I'll be discussing a very interesting version from New Jersey, but until then, there will be a few posts concerning other varietals from other corners of the world. This bottle has me a bit vexed. I can't really find any good information about this particular style. It isn't mentioned at all in Wines and Cognacs of Georgia and the brief blurb about it on Wikipedia is not helpful in the least. According to Wikipedia, Tbilisuri is a semi-dry pink wine made from saperavi, cabernet sauvignon and rkatsiteli. I can certainly tell you that that description is way off in describing the bottle I tried (pictured at left: the Marani/Telavi Wine Cellars offering, NV). My bottling was, I believe, 100% rkatsiteli and was definitely a white wine. I bought it for $10 at Bazaar in Brookline, which is where I go for most of my Georgian wine needs. My best guess is that Tbilisuri indicates that the wine is made somewhere around the Georgia capital of Tbilisi, but aside from that, I really don't have a lot of information on this bottle. In the glass it had a yellow straw color that was closing in on gold with a full glass. The nose was a little shy, as many of these Georgian examples have been. I picked up on some green melon and lemon cream aromas, but they weren't exactly jumping out of the glass. On the palate, the wine is medium bodied and semi-sweet. The most glaring defect of the wine is apparent as soon as the wine hits your tongue: the acid is shockingly low here. Rkatsiteli tends to be a pretty high-acid grape, but in this bottle, it's almost completely absent. This is a big drawback in a wine with some sweetness to it, as the sugar just overwhelms the palate and the wine feels big and clunky in the mouth. The major reason that grapes like chenin blanc and riesling can take a bit of residual sugar is that the wine has a nice acid streak to keep it in balance. Acid in white wine is akin to tannin in a red wine; it's the structure that the other flavors really hang onto. It's a shame, too, as the palate was layered and complex. There were flavors of orange cream, canteloupe, honeysuckle, candied lemon peel, white peach and mandarin orange wedges. It had a lingering finish composed mostly of canned mandarin oranges. I'm undecided about whether that's a good thing or not. I couldn't finish the bottle, though, as the lack of balance was so pronounced. If you don't mind drinking syrup straight out of the bottle, this wine might be for you, but otherwise, I'd give it a fairly wide berth and try one of the many other versions of rkatsiteli available. Next stop on my little tour of Rkatsiteli is the little region of Tsinandali in the former Soviet Republic of Georgia. 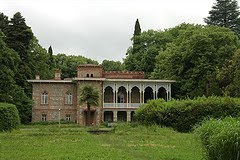 From a cultural perspective, Tsinandali is best known as the home of the poet Alexander Chavchavadze. I'm not familiar with the man's work, but he is apparently something of a big deal in Georgia literature. More to the point here, Alexander had a winery on his estate which, if I'm reading the wikipedia article correctly, was called Marani. There is still a winery by this name, but a bit of digging leads me to believe that it's not the same. Georgia wineries seem to go by more than one name a lot of the time and I believe what's labeled as Marani wine these days is perhaps better known as Telavi Wine Cellar. It seems that perhaps the old winery on the Chavchavadze estate is being converted into a museum which sounds pretty cool (that's the estate in the picture to the left). According to Wines and Cognacs of Georgia, Tsinandali has been "manufactured" since 1892. They go on to say that the "European" method is used in the production of Tsinandali, as opposed to the Khakhetian method or Imeretian method, where the wine is fermented in large clay jars buried in the ground. The blend consists of rkatsiteli and mtsvane grapes which are harvested, sorted, destemmed, pressed, fermented in temperature controlled tanks, clarified and matured in oak casks for 2-3 years, though this last part seems to be pretty variable (of the two Tsinandalis I tasted, only one specified the amount of time in oak: 9 months...neither bottle specified whether it was new or neutral oak, but more on that below). I had two bottles of Tsinandali to sample. The first was a 2007 vintage from JS Corporation (Corporation Kindzmarauli?) which retailed for $12. The second was a 2006 vintage from Alaverdi for $9. There seems to be more than one company called Alaverdi in Georgia (at least three and possibly four), and mine was made from this company. As a side note, almost all of the Georgian winery websites are just awful to try and navigate. Click on the link above and just try to get somewhere. Only one of the links on the opening page actually works, and that's the Home link. Once you click on that, it takes you to a page where you can navigate the rest of the site. So, the wines. The JS Corporation Tsinandali was a pale straw color with a pretty reserved nose. There was a bit of melon and vanilla, but not much else. On the palate the wine was clean and neutral tasting with very little fruit, which seems to be a hallmark of Georgian Tsinandali. The Alaverdi bottling had a blurb on the back which touted the "thin fruit taste." What fruit there is is mostly diluted lemon and lemon peel. As the wine came down to room temperature, the lemon flavors started to jump out a little more and a faint melon flavor showed up. It was medium bodied with pretty good acidity. If this actually spent nine months in oak, there's no way it was new oak. My guess is that this is mostly neutral oak casks or at the most a few batches see some new oak and those batches are blended into the final product. The Alaverdi Tsinandali had the same pale color with some silvery undertones to it. The nose was much more lively with an herbal characteristic. There were a lot of green melon and lime peel aromas as well. This wine had a little bit more heft to it than the JSC wine and also carried the characteristic rkatsiteli acidity. The fruit on the palate were was light with lemon leading the way backed up by some nice, round honeydew melon flavors. The finish was crisp and clean. Not a lingering finish, but just the kind of thing you're looking for with shellfish, either raw or cooked. Again, the back of this bottle touted their use of oak, but there's just no way that new oak was used here in any great quantity. The one caveat about this wine: if you buy it, drink it all the day you open the cork or just pour it out when you're finished for the day. This was abysmally bad the next day. For less than $15, the Georgian Tsinandalis were very interesting and certainly have their place at the table. Both were very clean and crisp on the palate but had enough body to them to possibly stand up to lighter chicken dishes. This certainly wouldn't be out of place as an aperitif, either. Of the two, the Alaverdi was more interesting and represents a better value. I will certainly be looking to have a few of these on hand once summer rolls around again. The Alazani Valley is formed along the Alazani River in the Khaketi region of Georgia. 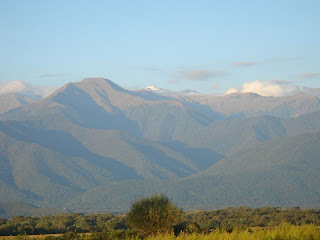 The river forms in the Caucasus mountains and forms part of the border between Georgia and Azerbaijan before it empties into the latter country. This valley seems to be the focal point of the Georgian wine industry with towns like Tsinandali and Akhasheni located there. 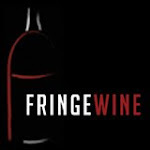 As mentioned previously on this website, they've been making wine in Georgia for a very very long time and for a big portion of their long winemaking history, they've been making wine from rkatsiteli grapes. There is archaeological evidence of rkatsiteli seeds dating back to 3000 BC. You may be asking yourself at this point "since the wine history goes back so far here, why is it that I've never heard of a lot of these grapes and wines?" The short answer is: the Cold War. The longer answer involves a history of occupation by foreign powers. Georgia's location at the crossroads between Europe and Asia made it a popular target and the country has been under the rule of the Mongols, the ancient Persians, the Ottoman Empire, the Russian Empire, the Soviet Union and the modern state of Russia. Whenever the nation of Georgia appears in the news these days, it's usually because of their ongoing conflict with Russia, who still occupies a good deal of land in the center of the country. The most disastrous of these occupations as far as the Georgian wine industry is concerned was the Soviet occupation. Behind the Iron Curtain, most of the production from Georgia was controlled by the Soviet Union and produced for consumption within Soviet borders. In the 1965 book Wines and Cognacs of Georgia, the emphasis is clearly on gross production numbers rather than on quality. You get quotes like: "It was after the advent of Soviet power that wine-growing in Georgia began to develop on a planned, industrial basis." To any quality wine lover, the word "industrial" sends a shiver down the spine. After the fall of the Soviet Union, Russia was still the biggest importer of Georgian wines and very few of them were exported to the United States. The former Soviet bloc area was still Georgia's primary market. That all changed in 2006, however, when Russia instituted an embargo on Georgian wine due to allegations of counterfeiting labels. The issue is a complex one that goes beyond the scope of this piece, but the primary result is that Georgia's major source of wine exports dried up virtually overnight and they have been looking to expand into newer markets recently. A few bottles are starting to show up outside of Eastern European specialty stores around Boston, but the widest selections are still in these specialty markets. So, all that as a prelude to this bottling. 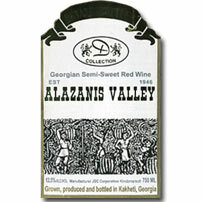 The label says Alizanis Valley, though this is clearly the Alazani Valley mentioned above. It seems that wines made with the regional distinction "Alizani(s) Valley" are a relatively recent phenomenon, first being produced in 1977. My guess is that this wine is akin to buying a French bottle simply marked "Burgundy." The grapes are probably sourced throughout the valley rather than in very specific sites as the rest of Georgian wine seems to be. I believe this bottling is 100% rkatsiteli, though other producers do seem to mix in a few other white varietals as well. The producer is the JS Corporation, which may also go by the name Coporation Kindzmarauli. It's hard to say, honestly. In any case, the label to the left is the label on my bottle, and this company seems to be the most heavily represented in many of the wine shops I've been to. The price tag on this bottle was $12 and the vintage was 2007. I should note that there are two wines from this producer labeled Alazanis Valley. One is white and made from Rkatsiteli grapes while the other is red and made from Saperavi grapes. The bottle color should be a dead giveaway for those of you shopping for this, but do double check the label very closely, as they are virtually identical (in fact, as I was writing this, I double checked the image, and sure enough, this is the red label...I can't seem to find the white one online anywhere and have already discarded by bottle). In the glass, this has a pale yellowish straw color. The nose is a bit reserved with lemon peel being the dominant note. The wine is off-dry, which brings up another point about Georgian wines. They have a lot of ways to indicate that the wine is kind of sweet, and I'm not sure i they are standardized at all. I've seen semi-dry, semi-sweet, medium-dry, medium-sweet and sweet all on different bottles. This one says semi-sweet, but to my taste, this was semi-sweet like a Riesling or a Vouvray with a little residual sugar in it. This is definitely not a dessert wine. The wine has a medium body on the palate and probably medium plus acidity. It's nowhere near as racy as the Westport Rivers offering. The wine is floral in the mouth with more stone fruit flavors like apricots and white peaches. There isn't quite so much zippy citrus in this wine. The finish isn't particularly complex or lingering, but has a minerally edge that feels nice and clean. For comparison's sake, Riesling is really the obvious parallel here, though this lacks the acidic structure of a fine Riesling. This wine is probably very similar to Riesling, though, in its ability to match up with food. This would be particularly nice with spicy foods, as the residual sugar would be most welcome to a scorched mouth. I find that on the whole, I have a better tolerance for the semi-sweet white wines than reds and have been focusing on them more lately. There's another semi-sweet rkatsiteli wine from Georgia that I'll write about very soon, though up next will be a comparison of two different dry wines from Tsinandali.